All in all, 2018 was not the easiest year for homebuilders in the Cape Fear region. Between torrential summer rains, Hurricane Florence in September, ongoing labor shortages, and a sudden spike in interest rates toward the end of the year, keeping up with the steady demand for housing in the area was a challenge. 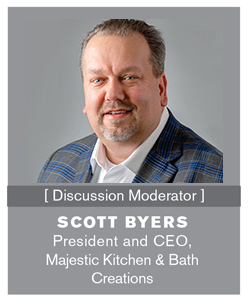 Despite those challenges, Scott Byers, President and CEO of Majestic Kitchens and Bath Creations, believes there is no more exciting industry to be in – and, perhaps, none more vital to the local communities it serves. 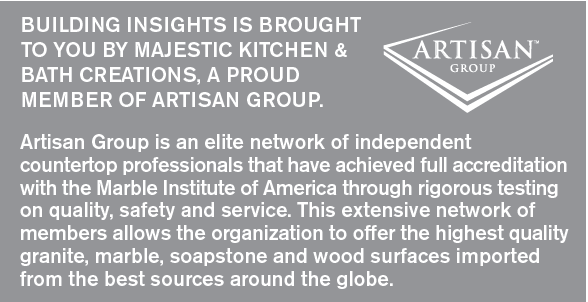 For more than 25 years, Majestic has served the building industry and, with more recent acquisitions of companies like Builders Glass & Hardware Inc. in Wilmington, has positioned itself to support builders across the Carolinas. 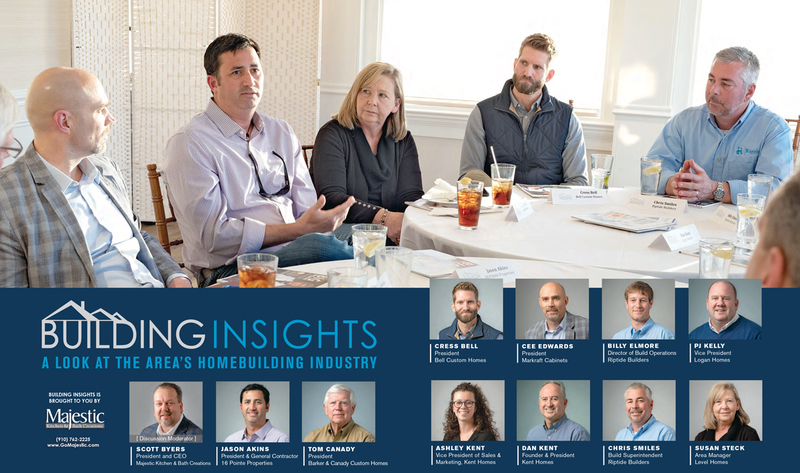 As part of Majestic’s commitment to the industry and desire to be the most professional trade partner in the Carolinas, Byers recently invited 10 representatives of the area’s homebuilding companies to share their struggles, successes and outlooks for 2019. How was the local industry impacted by Hurricane Florence, and what effects, if any, are you still experiencing? TOM CANADY: Well, there are still blue tarps on houses, and it’s been a while since the hurricane. The hurricane knocked all of us out for two or three weeks, and it didn’t just knock the builders out. I had sub-contractors who were going to the grocery store by boat for several weeks. It shut them down, too. They couldn’t work on the jobs we had under construction or the 150 homes in one of our subdivisions that needed water repairs. Catching back up from that takes a while. Storm-wise, we had very little damage. The storm just pushed all our processes back, in terms of the day-to-day. BILLY ELMORE: The residual effects of Hurricane Florence trickled down to production. And a lot of out-of-town sub-contractors and roofers came in and started picking up business from locals, so that became an issue. JASON AKINS: I am a smaller custom homebuilder so, luckily, we only had three homes under construction and didn’t have significant damage. But we had the same issue with labor; none of my sub-contractors could get into work. One good thing that I saw come from the storm was that suppliers like Majestic and Markraft were calling me and asking, “What do you need right now?” They were looking out for the local building companies because they knew we’d still be around in six months when some of these other out-of-town businesses had left. It was nice to see the people here sort of take care of their own. CEE EDWARDS: The way we approached it was to just separate hurricane-related work from our normal day-to-day operations. We’re up to about 73 hurricane- victim customers that have either come in the showroom or called us. That’s a pretty substantial amount. The unfortunate thing for them – and the fortunate thing for us – is that waiting on the adjusters and insurance claims and things like that has kind of staggered the installations and the needs. So, that’s helping us with the labor aspect of it. I think we’re going to see people still coming in because they’re waiting on insurance money or waiting to decide what to do with it. PJ KELLY: From a building company standpoint, the hurricane has pushed processes back, but we were fortunate. We had 135 homes under construction and none of them sustained any significant damage. We have a lot of good sub-contractors who wanted to get back to work and get back to normal. And our customers who we were building for were more than understanding about any delays. DAN KENT: I found the whole year to be kind of a triple whammy. First, we had the trade shortage. Then, during the summer, it rained almost an entire month, so we couldn’t get anything done outside. Then, we had the hurricane. When you combine those three things, that really slowed us down. We were scheduled to close 85 houses and in 2018, we could only produce 80 percent of that. CRESS BELL: We had 104 inches of rain in a year, when our average is 57. So, on top of everything else, you just couldn’t get things going or keep them going last year. You were just arm-wrestling the market. 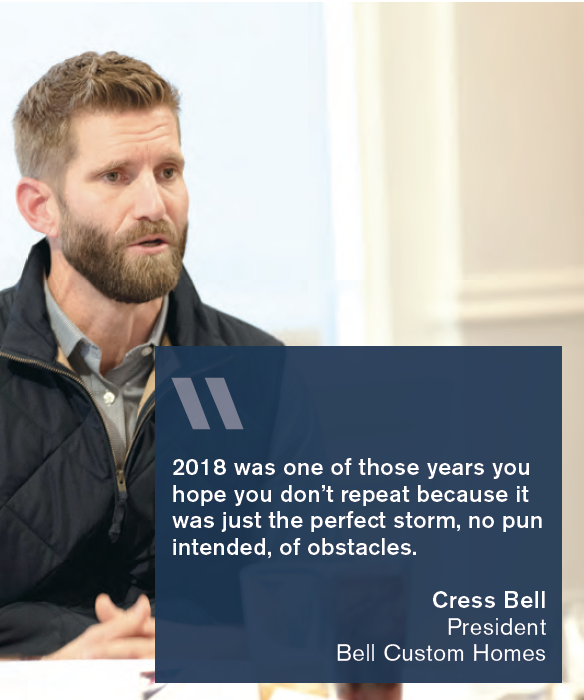 2018 was one of those years you hope you don’t repeat because it was just the perfect storm, no pun intended, of obstacles. And I think Florence inflated a problem we had before the storm – a shortage of qualified labor. Do you think the labor shortage will continue to be an issue for our area? CHRIS SMILES: We all share a lot of the same sub-contractors. So, we’re all jumping up and down right now, trying to hire sub-contractors that are in a position to leverage competitive pay. That means I’m going back and forth constantly trying to keep everything on an even keel. One issue, for me, is the cost impact on a project over the long term. For example, we have a handful of home models that we use, and we use the same company for framing on each of them. Even though it’s the same company, there are new and different people coming in all the time. So, in retraining them on what a house is supposed to look like, the next thing I know, I’ve got $3,000 or $4,000 more in supplies on this house than another house just like it. It is critical to have professional trade partners today. CANADY: That continual cycle of new workers is a big problem, and it’s not likely to change because a lot of people don’t want to stay in the trades. AKINS: The biggest issue I have, honestly, is finding people who care about the work they’re doing. They just show up and do a job. Some of the more experienced sub-contractors still care but maybe we are lacking some necessary training for the younger, newer workers. Insuring trade partners have systems and processes to deal with these challenges is crucial. Maybe we need to find a way to start attracting more qualified labor here to Wilmington. BELL: There’s a stigma about using your hands and being out in the field, and that’s not easy to change, but you can make a really good living doing a trade now. It’s interesting – there’s almost more work than people to do it in our market. There’s a natural supply and demand, and there’s more demand than supply with our current labor force. What concerns me in the bigger picture is value. Companies with good crews are paying to keep them, so that eventually trickles down to the end user. ASHLEY KENT: With business being so good right now, I think trade partners may be overcommitting on jobs. They’re taking on more work but it’s taking twice as long, so it has become harder to get quality work or to get that work done under a good production timeline. KELLY: About a year and a half ago, we started having meetings with our trade partners to check in and see what they need. I’m not saying that solved all our problems, but it has gone a long way to retain some of our long-term sub-contractors. 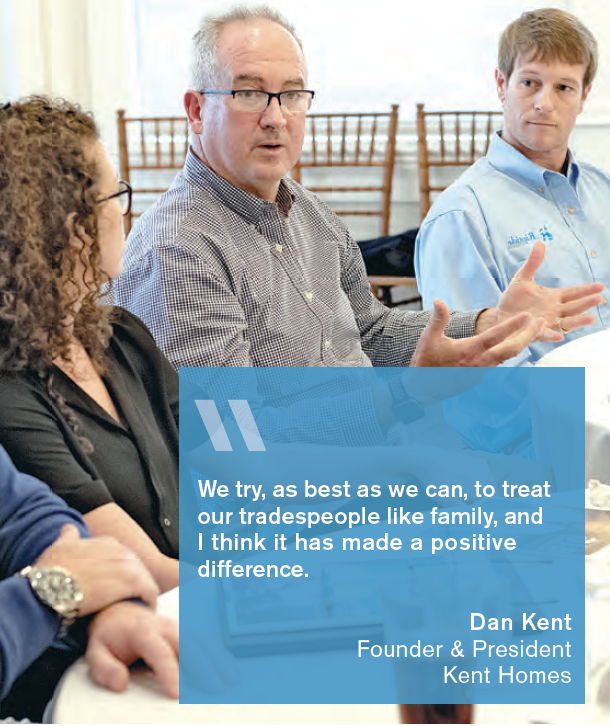 DAN KENT: To piggyback on what PJ said, all my employees are instructed to treat the tradespeople differently than regular employees because without the tradesmen, you can’t do anything. We try, as best as we can, to treat our tradespeople like family, and I think it has made a positive difference. Has it completely solved the problem? No. But I think our tradespeople are more loyal because they feel like we care about them. 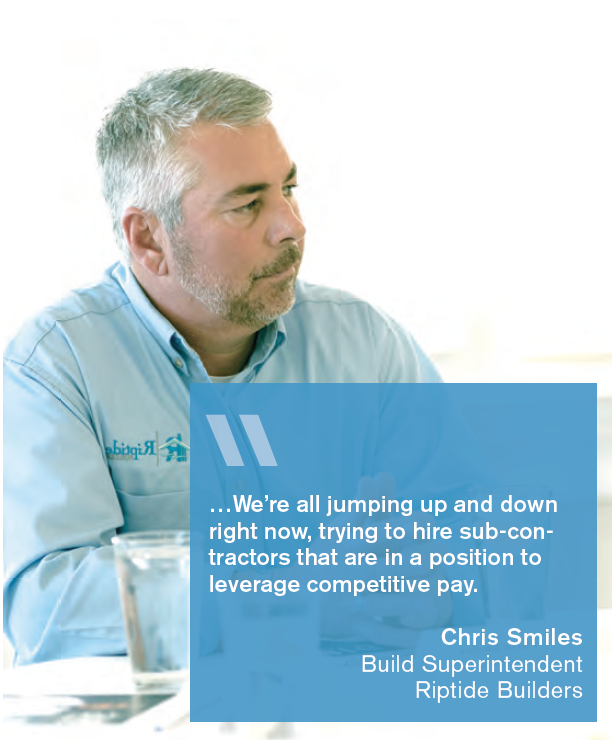 What other solutions are there to improving the local homebuilding labor market? 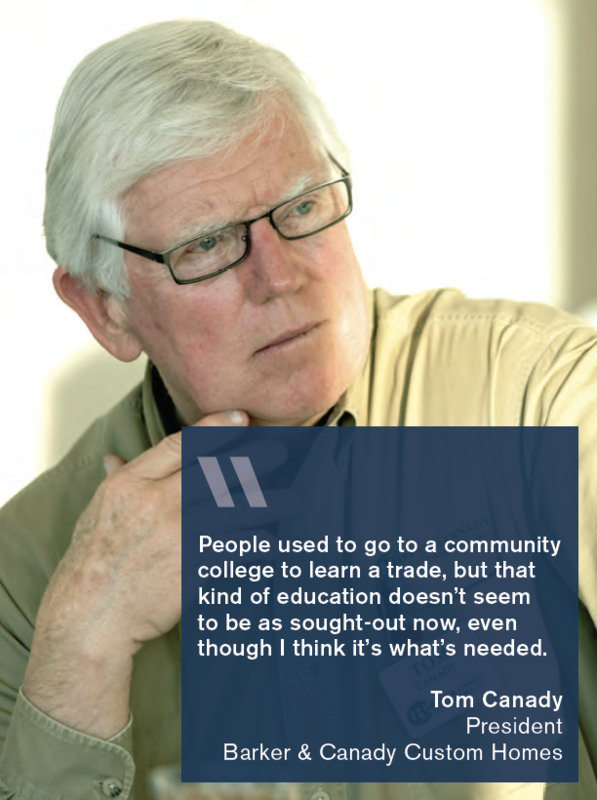 CANADY: People used to go to a community college to learn a trade, but that kind of education doesn’t seem to be as sought-out now, even though I think it’s what’s needed. BELL: To that point, I am on the board of directors of the Wilmington-Cape Fear Home Builders Association, along with PJ [Kelly], and education is one of our pillars. It’s how we focus on what kind of legacy we want to leave. We’re working with Cape Fear Community College [CFCC] on getting those old-school shop classes back in place for specific trade categories. But that’s on a micro level. The stigma about labor is global, and there is no quick change with that. What might make the change is the wage level some of these skilled workers can achieve. STECK: Letting young people know about the median income for trades would be a great thing to do. It could change the minds of some people, who may be currently sitting behind a desk with a four-year degree not making as much money as they’d like to be. EDWARDS: We have this discussion on a daily basis at Markraft, because installers are a dying breed. 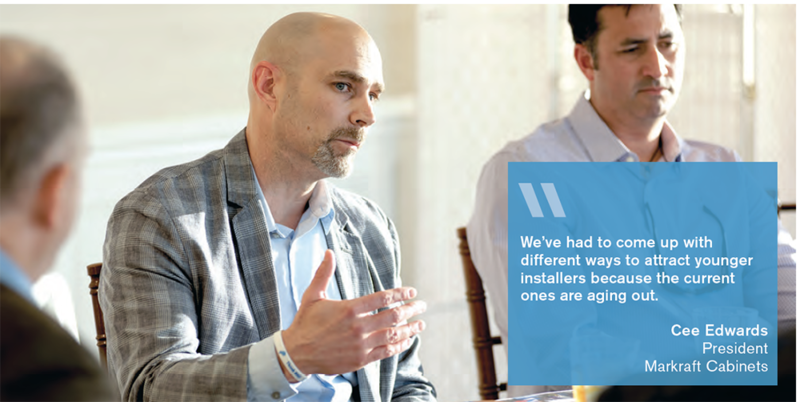 We’ve had to come up with different ways to attract younger installers because the current ones are aging out. We recently partnered with a construction management class at CFCC and talked to them about how they could make a good living as a cabinet installer. From there, we put together an apprenticeship program. We have a graduate of CFCC’s construction management program apprenticing with us now. We pay him a full-time hourly wage and we are teaching him everything we can about the industry. We also implemented an intern program for a current CFCC construction management student who can work part-time, and we pay him the same way. We’re trying to train them while they’re in school and coming out of school to let them know they can make a good living with us. What trends are you seeing with homebuyers? KELLY: Wilmington is such a destination area, and people really want to be here. We’re seeing the timeframe for people planning to relocate here shrink from three to five years to one to two years. And in the last couple of years, we’ve seen more people willing to buy a spec home rather than go through the building process. People are coming here; they want to be here. We recently participated in a trade show in Long Island and came home with the most leads we’ve ever had. I’ve done trade shows for 17 years and this was the best turnout I’ve ever seen. A lot of the customers I deal with that are retiring can sell their house in New Jersey, then come down here and buy one of our houses with cash and still put some money in the bank and have a good life. CANADY: I think what you are seeing now is the Baby Boomer generation starting to retire in larger numbers. They got pushed back a little bit by the recession in 2006 but now they’re ready and able to retire and buy a home here. 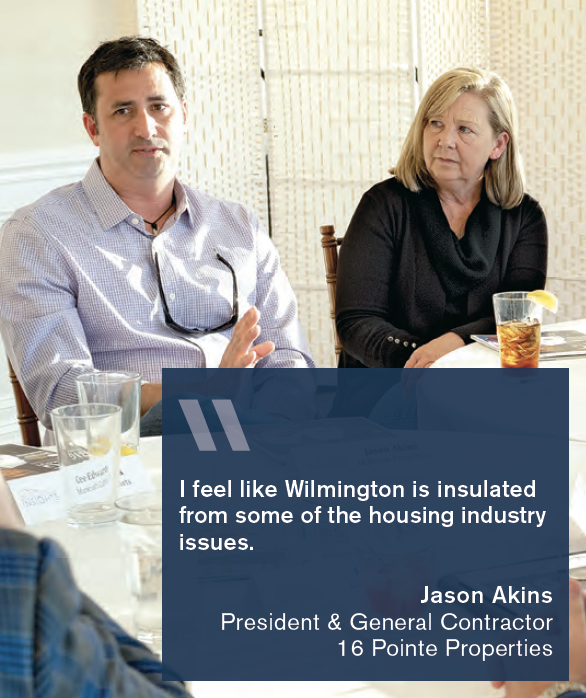 AKINS: I feel like Wilmington is insulated from some of the housing industry issues. I get calls weekly, if not biweekly, from people wanting to build down here. This area is just a destination for so many people. STECK: Interest rates are coming down, which is a good thing. Let’s hope that trend continues, because I think it’s going to spur the ones who had missed buying when interest rates were low the last time around and decided to rent instead. People get scared by interest rates, especially with the price range in Wilmington always creeping up because of land costs. So, hopefully we’ll get renters into their own houses this year. SMILES: A lot of our buyers are second-home buyers who are buying here now – but not coming here yet – because they want to go ahead and buy at the current price. 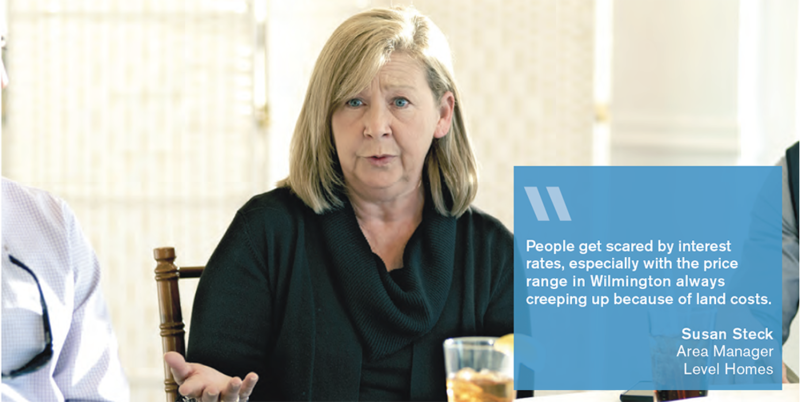 ELMORE: The activity, as far as showings, dropped a little bit when the interest rates popped up just a bit at the end of 2018. What is unique with us is that we have so many cash buyers – people moving here from other locations – that interest rates don’t really impact us too much. 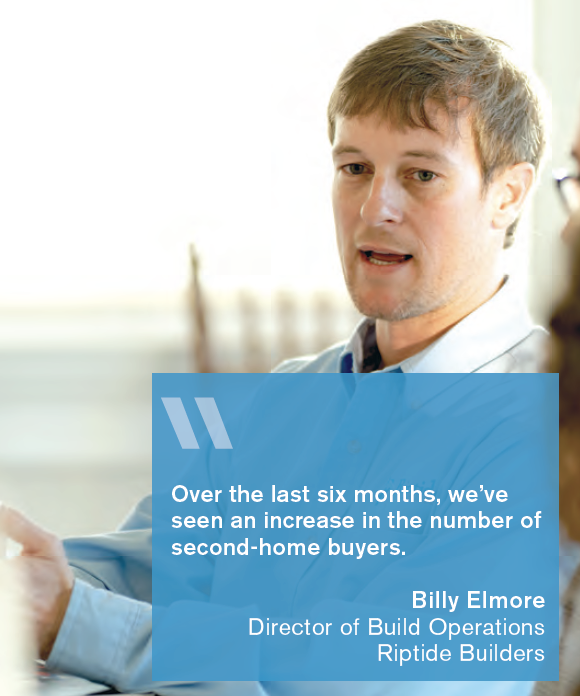 Over the last six months, we’ve seen an increase in the number of second-home buyers. We still have a lot of retirees who are buying here as permanent residents, but a lot of those second-home buyers are planning on moving here permanently in a few years, as well. 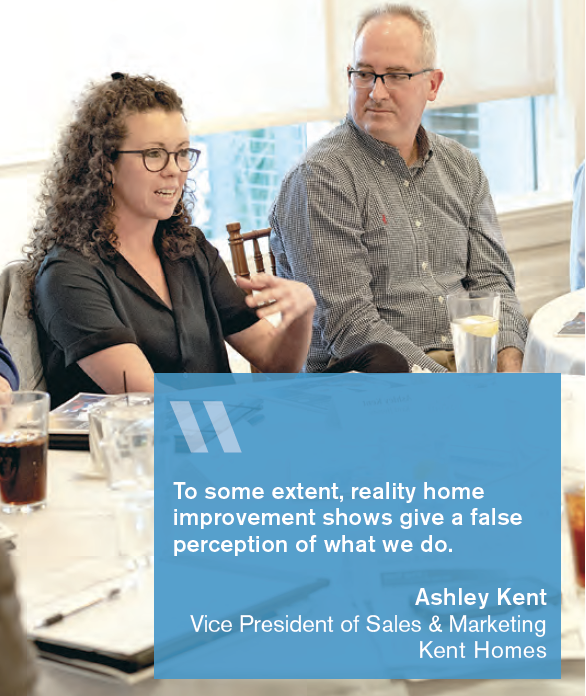 ASHLEY KENT: Something I’ve seen from the sales side of this industry is people want what they want – they watch HGTV and think they can renovate a home in a week within a certain budget. To some extent, those shows give a false perception of what we do. People have very high expectations – they want what they want and want it at a low price. What kinds of homes are people seeking? BELL: When I came back to North Carolina in 2011, I decided to bring a little bit of a West Coast design aesthetic, and we got immediate attraction from that empty-nester retiree who wanted a bolder and more creative house. I thought that was interesting because, at the time, I was holding my breath not knowing how it would be received. I think some of these new trends, like the modern farmhouses, really aren’t designated to a certain age. People just want something different that they’re proud of and will love to show off. That has been fun for me as a builder. I’ve put a lot of time into design and trying to do things differently, and the market has reacted really well to that. ASHLEY KENT: You see those new trends more so incorporated into neighborhoods, where a few years ago those kinds of houses were so rare. How is technology changing the homebuying and homebuilding process? AKINS: People come in with a million pictures on their Houzz.com account. They don’t always know exactly what it is they want but they come with lots of ideas about what they like and don’t like. STECK: I think most buyers are doing a lot of shopping and research on the internet first. And if they’ve showed up to us for a tour, I look at that as positive feedback because they’ve already researched online what we have to offer. In terms of our marketing, geo-targeting and geo-fencing are working very well for us. You can target an entire neighborhood you want to reach, so that they see our ads when they go online. That has been a great tool for us, since we’re so new to this area. KELLY: From a building perspective, we don’t even take invoices from sub-contractors anymore, for example. I can pay a sub-contractor from my phone and automatically generate a check; I don’t ever even see an invoice. ASHLEY KENT: I think, across the board, people are really savvy with technology now. They get on Facebook and NextDoor [private social network for communities], so customers will post questions about what they should have in their new home to see what their connections on these social media sites have to say. Then, they’ll come in to see us with a list of 50 bullet points of features they want or think they should have. BELL: Where efficiency gains are possible, we absolutely employ technology. But we try to stay somewhat old-school, too, so that it’s easiest for our end users – the trades people and suppliers. You can have too much technology and try to do too much with it. We have a scheduling program that is a 30-day outlook in a spreadsheet that everyone can use, and I get more traction out of that than some massive schedules that can take several hours just to update.